If Bigfoots are real, why hasn’t anyone ever been able to capture one? Why haven’t we ever found any of the bones or remains of Bigfoot? Have hair strands been found in the areas where Bigfoot has been sighted? If it is real, what kind of animal do you think it has evolved from, an ape? Do you think it migrated from Asia across the Bering Strait? Have any been sighted in Alaska, for example? What other unknown animals have been discovered lately? If there are species of animals that have not been identified or found by humans, what areas of North America would they most likely be found? What other parts of the world might we discover new animals? Where and when did you start searching? How do I get into the field of cryptozoology? Are there any classes taught on the subject? Do you have any books you have written that one might obtain directly from you? What can you tell me about a Bigfoot Museum in Portland? Are you available to speak on my radio program? At my college? To my service club? How can I learn about Momo, the Grassman, the Honey Island Swamp Monster, etc.? Where are your columns published? Do you think Komodo Dragons could be responsible for some other location’s monster reports? Could dinosaurs really be in Africa? What do you think of lake monsters in Lake Champlain? Have you heard of a theory linking a certain strata of latitude and the sightings of mysterious lake creatures? Any references or suggestions where to search? You mentioned a Chupacabra website – where is it? How can one find a Bigfoot site? The IVBC site? A Yeti one? You coined the words “Dover Demon,” “Phantom Clowns,” “Mystery Kangaroos,” and other weird phrases. Can you give me an update on them? Do you know John Keel? Bernard Heuvelmans? Did you know Ivan T. Sanderson? Actually, many Bigfoot-type creatures have been killed, caught or examined around the world, but no scientifically “good evidence” has yet been able to be brought back to help classify the animals. It took almost fifty years to find the first mountain gorilla after the first lowland gorillas were found; it took over 60 years to capture the first live giant pandas after scientists actually believed the giant pandas existed. Since the modern era of “Bigfoot” research began in 1958, we really are just at the beginning of our research, searching and hunting for them. Also, the famous “Minnesota Iceman” (of 1968) seems to have been a real body whose owner got scared he might get in trouble, and he switched it with a fake. Such things happen in chasing Bigfoots. The second question from the student is a good one – but think of this – how often do we find a dead bear or dead mountain lion in the woods? Almost never. Porcupines and rodents eat the bones of dead animals. And most dying animals hide themselves in caves, and other quiet places when they feel sick – and then die. We are not surprised we haven’t found any Bigfoot bones. Some people like Dr. Grover Krantz think the Bigfoot is related to Gigantopithecus blacki, a giant ape commonly assumed to have died out several hundred thousand years ago. But I and a few other cryptozoologists think that the Bigfoot-Sasquatch types (and their relatives in China) are related to the fossil apemen, Paranthropus robustus, found from fossils, in Africa and Asia. Have any been sighted in Alaska, for example? Virginia? Many new mammals have been found in Vietnam in a jungle area called the “Lost World” with some new animals found in New Guinea and Nepal. The new monkey found in Nepal a couple months ago was living in the foothills of the Himalayas, near the homeland of the Yeti or Abominable Snowmen. Also go to http://perso.wanadoo.fr/cryptozoo/welcome.htm for more information on newly discovered animals, and more about cryptozoology. Too many to list but the most hopeful seems to be Vietnam’s “lost world” area, the Afgan-Pakistani border and central Africa. While I grew up in central Illinois, I have traveled and lived all over the US. I began doing my first cryptozoology field trips and library research in 1960, when I was just 12. While While I do not have copies for sale of *Mysterious America* (London/Boston: Faber and Faber, 1983), *Curious Encounters* (London/Boston: Faber and Faber, 1985), *Creatures of the Outer Edge* (coauthor Jerome Clark, NY: Warner Books, 1978), or even *Tom Slick and the Search for the Yeti* (London/Boston: Faber and Faber, 1989) any longer, they all are often available from old bookstores or online book search outlets. I sometime have copies of my two new 1999 books, *The Field Guide to Bigfoot…* (coauthor Patrick Huyghe) and *Cryptozoology A to Z* (coauthor Jerome Clark), so please contact me for costs, or find them by clicking on the book titles or covers seen throughout this website. Of course, there are two Portlands, and there appears to be two museums in development. Portland, Oregon, has established a Roger Patterson Memorial Hall of Fame, as of October 1997. I was one of the first ten inductees. This is to be part of a future Museum being created by Ray Crowe’s Western Bigfoot Society. To date, it is still on the drawing table. I am in the beginning phrases of planning for a Rare Animals and Cryptozoology Museum to be created in Portland, Maine, by the year 2000. Artifacts, funding, ideas, exhibits, cryptozoo toys, and much more are welcome. Wanted plaster casts of footprints, from the East, from the West, internationally taken. Use the address above. Have an exhibit with your name on it – as the source of the donated item. Stay tuned for future details. Are you available to speak on my radio program? At my college? To my service club? Yes, I frequently am interviewed by radio program hosts. contact me with the details. I also will come to your college or service club. For those that are seriously interested in hosting one of my fascinating slide lectures on any one of several intriguing cryptozoological expeditions or topics (from Sasquatch to Sea Serpents, Yetis to Yerens, Giant Snakes to Thunderbirds), please contact me via email for my rates. There are many regional names for local Bigfoot-type creatures in North America. When my next new book (which is already written) is published in April 1999, hopefully some sense will be made of the many seemingly different kinds of hairy hominoids. Until then, I will begin to carry, at my website’s bookstore, a selection of small press and regional books on these varied types of creatures. I have written for The Anomalist, as well as other journals and magazines. I have a regular cryptozoology column “On the Trail…”, every other month, in the London-based *Fortean Times. * I also have a more general column about matters unexplained or forteana, “Mysterious World,* in the national magazine, *Fate. * Some “Mysterious World” columns cover cryptozoological topics as with a recent one on the names for Bigfoot, and another one on the reports of a 1700s’ werewolf which some felt might have been a striped hynea. I formerly had a regular column in *Strange Magazine* called “The CryptoZoo News” – and it may be found in back issues of that magazine. And many other related inquiries. I remain skeptically open-minded about a wide variety of sightings and encounters. Obviously, in investigating this material, one must look for the most mundane answer first. 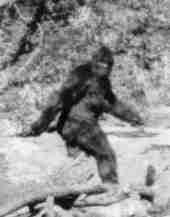 However, to explain cryptozoological sightings in terms of even more extraordinary feats of known animals’ behavior or distribution makes almost as much sense as saying that Bigfoot are stepping out of flying saucers. Good science is still important to these examinations, and we all must be careful about jumping to conclusions just because the answers are not coming easily. Have you heard of a theory linking a certain latitude and the sightings of mysterious lake creatures? Any references or suggestions where to search? The best summary of this can be found on page ten of Bernard Heuvelmans’s famous 1986 checklist: “Attention must be drawn to the fact that all these long-necked animals [so-called “Lake Monsters”] have been reported from stretches of freshwater located around isothermic lines 10° C; that is, between 0° C and 20° C (i.e., 50° F, between 32° F and 67° F) in both Northern and Southern hemispheres. One could hardly wish for better circumstantial evidence of their existence.” Source: Heuvelmans, Bernard. “Annotated Checklist of Apparently Unknown Animals with which Cryptozoology is Concerned,” Cryptozoology, 5: 1-16, 1986. Where can one find out more about that hairy guy in the iceblock shown at state fairs, the Minnesota Iceman? Instead of giving you all of the links here (several will be visible nearby on this website, of course), I would suggest the easiest way to find any of these sites (including info on joining IVBC) is via a Search Engine such as InfoSeek or AltaVista. These will be very up-to-date, and give you many choices to meet your individual needs. Since *Mysterious America* was written in the early 1980s, I have tried to keep readers of my later books and columns informed as to the latest happenings of all these critters. The Dover Demon, seen in Massachusetts in 1977, may be related to sightings of other small creatures like it. Despite a new theory going around that it was merely a newborn horse (a story we checked out at the time), the Dover Demon remains a real “Unexplained.” Some of the other mysteries continue to repeat in different times and places, and keep all of us guessing.